Yesterday morning, Ben and I got up and went to the gym. This is not that unusual – he goes most mornings, and I often join him rather than going later in the day. Yesterday, however, it was 0 degrees Celcius when we left the house at 6:30, AND there was snow on the ground. It is a four block walk. We both kept our heads down and our shoulders hunched as the icy wind whipped around us. “This is not the right jacket for this weather,” Ben said through chattering teeth. I was trying to ignore how the cold bit through my sweatshirt – or ‘windcheater’ as they are called in Australia. It was neither warming me enough to induce sweat OR cheating the wind. There is a traffic light where we cross a busy intersection, and the wait can be minutes. We were lucky that it changed just as we approached, and we crossed for the final block of our journey. The beacon of the gym lights glowed ahead of us, and we quickened our pace. As we stepped through the double doors into the brightly lit entry, the heat washed over us and we both sighed, relieved. I headed to the cardio equipment, and climbed on ready to take my body temperature from one extreme to the other. 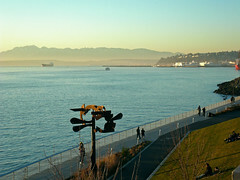 The long bay of windows overlooks Puget Sound, and interestingly, the path that runs alongside the water. I watched incredulous as runners, covered neck to ankle, made their way along the path in the 0 degree weather. “Crazy buggers,” I thought to myself smugly from the warmth of the gym. Later in the day the sun broke through the dense cloud. I had walked up to the supermarket, as much to relieve the effects of cabin fever as to shop, and the fresh air combined with the milky sunlight seduced me into going for a run. When I got home I suited up – neck to ankle – with running pants, gloves, hat, and fleece, and headed out to the path alongside the Sound. It was chilly, but it felt good to breathe the crisp air, and to watch the sun slip below the mountains in a fiery haze. I did a 3 mile (5 km) circuit and returned home, feeling energized. After a quick restorative shower, I sat down to write some emails. I looked at my desktop, where a widget proclaims the temperature in Celcius. 4 degrees. 4! Four little degrees are what separate me from the ‘crazy buggers’ on their morning run. I feel that I MAY just be acclimating to the cold. Just a bit. Wow, so different to what we’ve been experiencing in Melbourne.